For the next installation in the “Who/What/Where/When/Why” (5W) feature reviewing aspects of Providence’s urbanism, history, architecture, and living, I decided that as the Main Post Office’s new long box of garages doors expansion building finishes construction on Corliss Street that this would be a good time to reflect on the significant architecture and design of the main structure itself. The building is probably best known in the area for being home to the nation’s first automated sorting system. 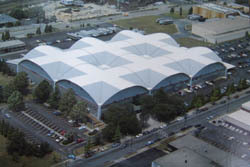 Finished in 1960 and designed by the Maguire and Associates architectural firm, few may have paid as much attention to the building’s complex parabolic roof design that is completely unique for the Providence area. In Wm McKenzie Woodward’s PPS/AIAri Guide to Providence Architecture (the source of information for this post and an essential purchase for all interested in Providence urbanism and architecture), he discusses how this building was almost certainly influenced by Eero Saarinen’s landmark TWA International Terminal (1962) at New York’s Kennedy Airport (which was then called Idlewild Airport). While too big to be considered delightfully quirky, it is an interesting, unusual, and highly visible landmark that should be better appreciated than it is. Cigna campus in Bloomfield Ct..
Another structure ,by the way that shares architectural firsts with the Providence building is the main terminal at St Louis Int’l Airport.